Nonetheless, I am concerned that too often hungry-to-learn dancers forfeit the magic of tango in that many dancers rely on a combination of "tango moves," which have been "written" by dance teachers. The "moves" are often taught even as no music is being played, although the majority of moves were discovered by listening to music and one's partner. What is the better analogy for the magic of tango--something "scripted" or something "painted"? "Choreo" is the word for the art of dance in Greek and "-graphy" means "written-out." So choreography means to follow what has been "pre-scripted" for your dance. In social dance the prescribed dance has taken away Music's role! Personally speaking, I want the music to prescribe what I do and also how I feel my partner's inspiration as what "prescribes" my steps. Keeping things very simple with an elegant tango walk is the basis for this--the opposite of being a walking encyclopedia of choreographed tai chi moves to music. I actually practice tai chi with music at times, but the movement is central in this tai chi practise and the music is a backdrop. Tango has music's magic in the foreground. I am suggesting the dancers can be the instrument of music, or "Music's Graffiti." It's true that "graffiti" also has its Greek roots (γράφω) as something scripted. We get the word "graffiti" through Italian (meaning to scrible rather than chisel words) but "graffiti" has its new meaning as a painted art form in public: I think the dancer being the spontaneous, slightly illegal, street art form is the perfect analogy for social tango: The goddess, Musica, uses normal people to paint her inspirations on wooden floors the world over. Divine graffiti? Music constrains us in the most joyful way. She makes us dance a certain way. She controls what we will do. Having said this, I have a test--although an imperfect one--of watching performers who appear to have scripted out (choreographed) their interpretation of a particular song. There is a difference between those who choreograph and those who don't, but I have an idea that it is not easy to know the difference for the audience. For a test of my theory, let me present to you Horacio Godoy, dancing to La Muchachada del Centro by la Orquesta de Francisco Canaro (1932) in two versions with two different partners: Celia Berra and Magdalena Gutierrez. First play each rendition for a while or all the way through. Then decide whether the couple is dancing spontaneously, exacted by the music or pre-planned, written-out dance (choreography). Then, we'll talk about it below. So I suppose you have a theory of the dance being choreographed or spontaneous. Surely it is a bit of both through hours of practise together, but where is the emphasis? Now, to test your theory of choreography or spontaneity, mute one of them. Start the top performance (Berlin) at 11 seconds and the bottom one (Belgrade) at 3 seconds. It doesn't work perfectly, but you can see that it is Music's graffiti being painted here and not dance-written-out (chroreo-graphy). There are too many variations between the two. I have done this with others, and am amazed at zero variance between performance. Horacio and his different partners are constrained by the music in the most wonderful way. Now, the lesson here is that you Let the Music Paint You. 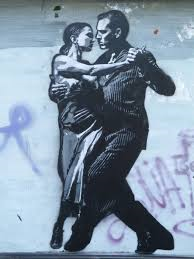 Be the music's spontaneous graffiti, painted on the dance floor. This is social dance at its best. Thanks for sharing this feeling of the music controlling your every move in tandem is the zone where the leader/follower paradigm disappears.